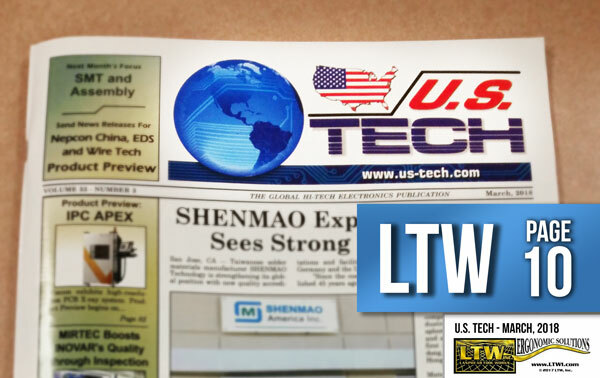 Recently, LTW’s height adjustable collaborative robot table (known as the “CoBase™,”) was featured in the Tech Watch section of “The Global Electronics Publication,” U.S. Tech. Check out what LTW’s Heather has to say about the product! Height-adjustable E4H tilt cobot table. One challenge to using collaborative robots, also known as cobots, in daily manufacturing is their lack of mobility. Now LTW has created a height-adjustable, tilting table that serves as a base for cobots. CoBase™ is a patented industrial table with options for a tilting tabletop, an inverse cobot mount, cobot cart, and more. Some cobots, such as those from Universal Robots (UR), are so user-friendly that no knowledge of coding is required to create and run a program. Unlike room-sized, heavy automation, lightweight and flexible UR cobots can be used alongside humans with no safety guards. Force-sensing technology enables the robot to stop operating if it encounters obstacles in its path. Cobot companies compete to make the most collaborative robot on the market, but a robot is only as collaborative as its base. LTW’s solution, the E4H tilt cobot table, or CoBase, is height-adjustable with four electric actuators. While cobots may come in fixed sizes, workers’ heights can vary dramatically in the workplace. In order for a cobot to be truly user-friendly, working with and programming it should be tailored to the user’s height to prevent back pain and musculoskeletal disorders (MSDs). With just the touch of a button, the base raises and lowers. The table’s height-adjustability can also raise a cobot’s level of usefulness. While some companies have just one dedicated purpose for each of their cobots, other companies move cobots to different applications when needed. Different applications may come with different heights: the CoBase may need to be one height for CNC tending and a different height for pick-and-place operations. The CoBase can be wheeled to where it is needed, adjusted and reprogrammed easily. To make cobots even more user-oriented, CoBases can be made with tilting tabletops. Instead of looking straight down at a tabletop for work all day, users can tilt their work to an angle that is more comfortable, improving their posture. This can also expand the cobot’s usability by adjusting its reach with the tabletop angle for custom projects. The CoBase is designed to be a complete solution with easy set up and to provide a place for every part of the cobot. The cobot motor and controls are kept safe and out of the way with the under-tabletop mount. Cord management is simplified with included cord wraps and winders that keep the CoBase workspace neat and organized. Aside from attaching the cobot to its custom tabletop bolt pattern, no tools are needed for set up. Users can start programming the mounted cobot within minutes. Cobots are portable around plants with the CoBase’s locking swivel casters. Cobot systems can be quickly moved between tasks and areas to run different cobot programs without wasting time mounting cobots onto different tables or surfaces. LTW offers custom tabletops, such as aluminum, steel, maple block, laminated, and ESD laminated (anti-static). CoBases can be painted with company colors to match the rest of the workplace. Other options include electrical box mounts and forklift tubes. LTW is developing more CoBase models, including non-height-adjustable, inverted and cart versions. The CR-GB (collaborative robot — general base) has a static height with no actuators and has the lightest price tag in the CoBase series. The CR-E4H is a non-tilting version of the original height-adjustable E4H tilt cobot table. Both of these CoBase models can come in inverted versions where the cobot is mounted upside-down above the tabletop. The CR-E1 cart is modeled after LTW’s height-adjustable material handling E1 cart and enables users to wheel their cobots to different fixtures around the plant, securely dock the cart to the fixture and run a program — all without the cobot having to leave the cart. The CR-E1 cart adds flexibility for companies that want to use their cobots actively in multiple areas of their businesses without wasting time re-bolting cobots to different surfaces. Every cobot can be used on a CoBase, regardless of brand or model. Each CoBase is designed with a custom bolt pattern specific to the cobot or robot being used. If a company upgrades to a new cobot with different bolt pattern, the tabletop can be replaced by LTW with a corresponding tabletop bolt pattern for the new cobot. 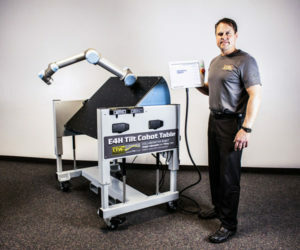 If a company ever chooses to stop using cobots, the CoBase can still be used as an industrial height-adjustable, tilting table, which also makes for a great welding or assembly table. This dependable solution can be used for a variety of applications and is designed to be used with any current and future cobots.